Night of the Creeps fans, prepare to burst. The seminal 80s horror movie is getting gut-wrenching release from Scream Factory in May. Teaming with NECA artist Devon Whitehead, Scream Factory is offering an extremely limited edition blu-ray (limited to 3000 units in the US and Canada), which comes complete with an insane Tom Atkins action figure! 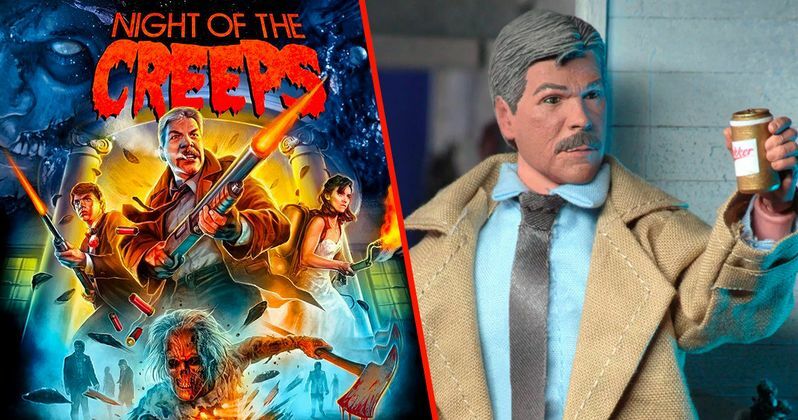 Let's just call it now, this 8" clothed retro Tom Atkins action figure complete with Cameron's shotgun and a beer, will probably be the greatest collectible a horror fan can grab in 2019. Thrill me! When an alien experiment goes awry, it crashes to Earth in 1959 and infects a young college student. Twenty-seven years later, his cryogenically frozen body is thawed out by fraternity pledges ... and the campus is quickly overrun by alien creatures whose victims turn into zombies! Fred Dekker's thoroughly enjoyable throwback chiller deftly mixes all sorts of genres while simultaneously having fun with them (the college and all the leading characters are named after famous horror movie directors). Pre-order your copy of the Night of the Creeps Limited Edition Blu-ray from Shout! Factory today....before it's too late.